Feast like Khaleesi this Game of Thrones season. WITH the cold weather starting to set in, there’s nothing better than a hearty, winter-warming meal. And what better than beautiful slow-cooked lamb shanks atop of perfectly whipped mashed potatoes. 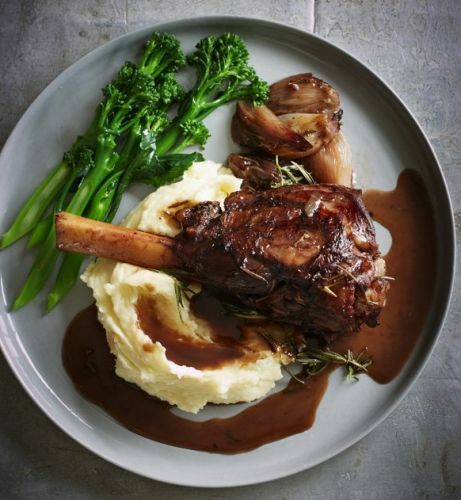 Get your hands on to these braised shanks in red wine, balsamic and rosemary, – a delicious dish for all this winter. Place a heavy based casserole dish over a moderately high heat. Rub some olive oil over the lamb and season with salt and pepper. Sear for 8 minutes or until browned allover. Place the shallots in the pan and cook for 4 minutes or until coloured. Add the wine, stock, vinegar and rosemary along with the lamb. Bring to the boil, cover and place in the oven for 2 hours or until very tender. Remove the lid and cook for a further 30 minutes. Turn them over once or twice if they are colouring too much. Use a spoon to skim off any fat that has risen to the surface and reduce the sauce over a high heat if necessary. Serve with olive oil mash and steamed broccolini.